"For mankind, I can't see any way out, except terrorism. We kill the 1%. Which 1%? The only way for mankind to get out of this misery is to kill the 1% who owns everything. The 1% who have put us in the position where humanity has no value. The rich. And the politicians who are the puppies of the rich." 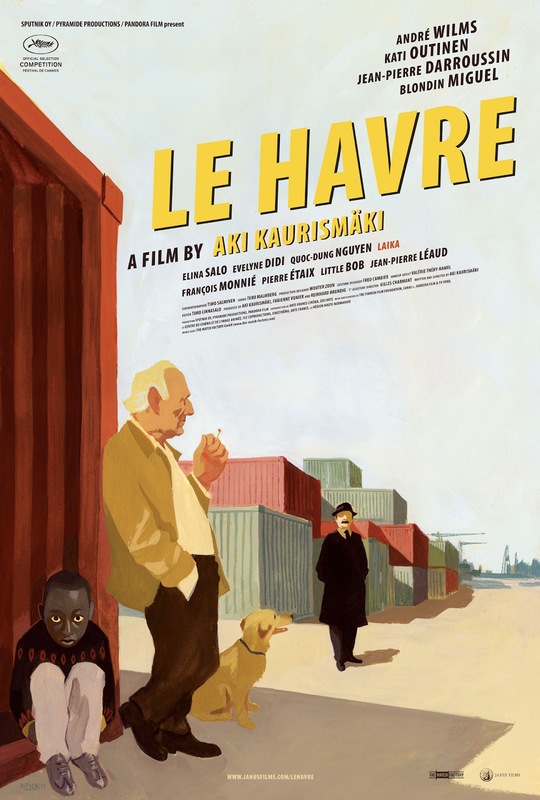 A statement from the Finnish filmmaker Aki Kaurismaki, a man that despairs of mankind in general, his word’s not mine, and famous for making dark and joyless comedies has made a lovely wee French fantasy where people not only talk to one another but are prepared to help each other out when a crisis arises. 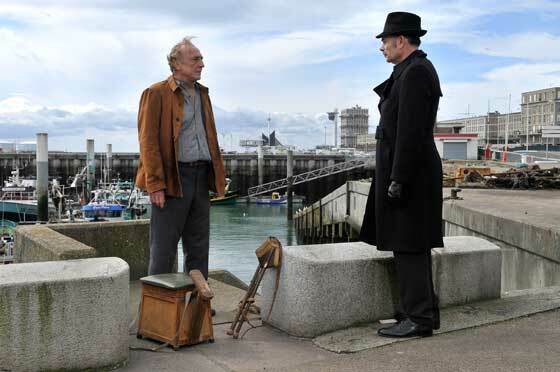 Le Havre (2011) is set amongst a run down waterfront community in the Normandy port of La Havre, which gives the film its title, and could be anytime in the last 50 years, except for the obvious give away of a satellite dish and its modern subject matter. Refugee Idrissa arrives at the Port. At the docks the Port Authority inform the local police that they suspect a container to be full of refugees from the West African state of Gabon. When this giant steel box is opened a young boy, Idrissa played by newcomer Blondin Miguel, makes a dash for freedom. Bohemian turned shoeshine Marcel Marx (Andre Wilms) discovers the young lad hiding in the river Seine and takes pity on him escorting him back to his home. Meanwhile Marcels wife Arletty, Kaurismaki regular Kati Outinen, has been admitted to hospital with what we suspect is cancer. 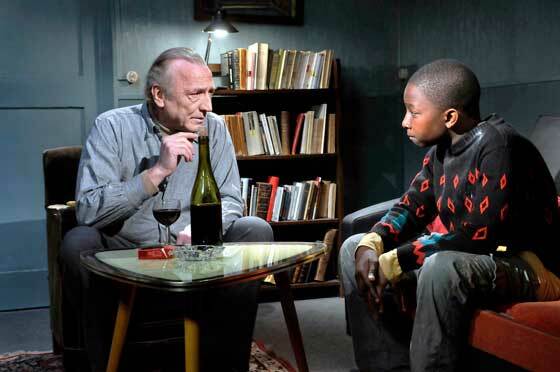 Marcel, who suspects the authorities in the form of Inspector Monet, Jean-Pierre Darroussin last seen in The Well Diggers Daughter (2011), are in hot pursuit, decides he must get the young refugee to London so that the boy can be reunited with his mother, but that will take time and money! This affectionate political fairytale does have a serious side however, highlighting how Europe deals with desperate refugees from the developing world that wish to share in the benefits (at present) we all take for granted. Humorous and enjoyable this warmhearted humane movie is a real treat, with carefully drawn characters even in minor roles, some very convincing acting and a wonderful old-fashioned style giving a conscious nod to classic French cinema. Every true film lover should see this delightful film. The old shoeshine and the boy from Gabon get to know one another. 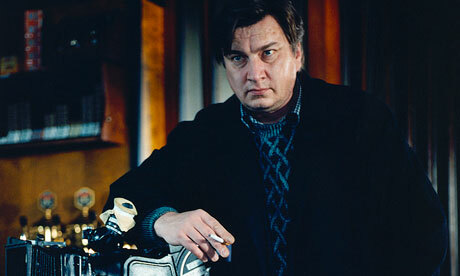 Aki Kaurismaki in an interview with Simon Hattenstone in The Guardian on the 4th April 2012.